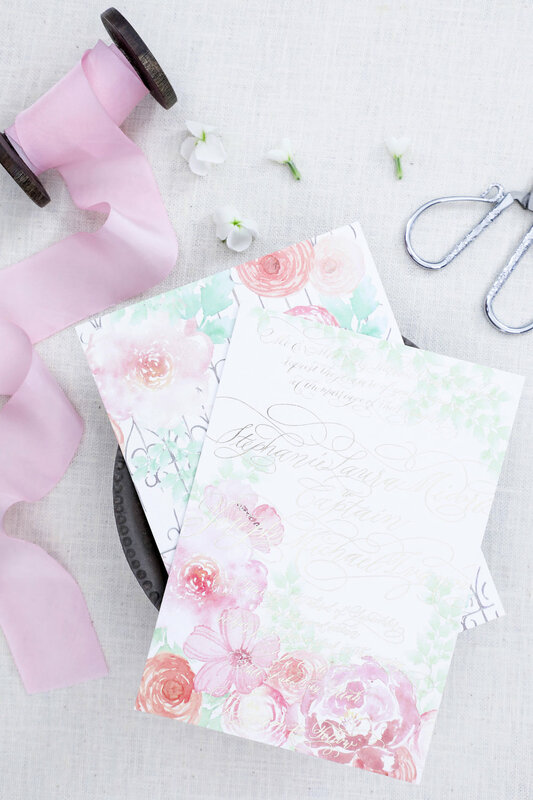 Creating the hundreds of shades in a watercolor wash or some gorgeous loose florals is a breeze when it comes to flat printing. We love this kind of printing for recreating the intricacies of colors and gradients. The possibilities with flat print are endless! One great way to combine metallic foil with additional colors is to combine flat printed artwork with foil lettering. Foil comes in a plethora of colors and shades, including gold, silver, rose gold and copper. We approach letterpress in two different ways. In the first, we can do an entirely pressed suite, which would be the case when your design focuses on calligraphy, typography, and simpler line artwork. Or alternatively, the second way is in combination with flat print. If you're interested in the tactile aspect of letterpress but don't want to give up some more complicated watercolor artwork, for example, we can also combine the two. The artwork would be flat printed first, after which the calligraphy could be letterpressed over the top.